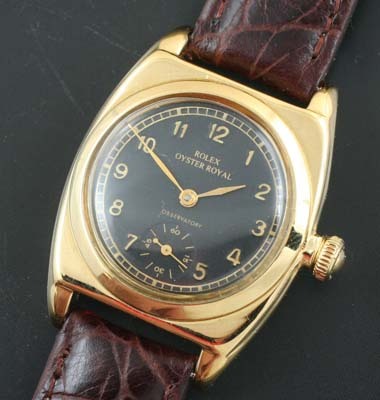 Restored gold filled Oyster model with unusual case. Black dial and gold case. Rolex Viceroy. 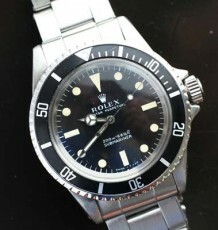 The Rolex Viceroy is one of the more unusual vintage Rolex watches, simply because the Oyster case is so unique in appearance. The stepped flat top case with the porthole style dial window is one of Rolex’s most pleasing designs. The gold-filled case is in excellent shape. The genuine Rolex Oyster Patent “Monks Head” crown still screws down tightly. Both the case reference, 3116 and the serial number are still clearly visible on the stainless steel case back. The watch dates to the mid 1940’s. 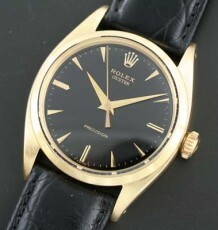 The watch is fitted with a Rolex manual wind 10 ½ hunter caliber 710 movement. The restored Rolex dial has a deep black background with raised gold Arabic number markers and desirable leaf shaped hands. 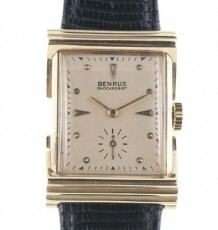 The watch is supplied on either a black or brown leather strap. 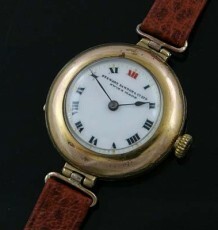 The watch measures 30mm wide by 39mm long.